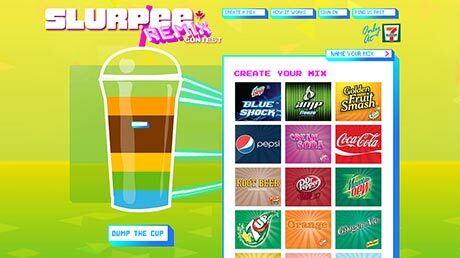 The contest application allowed visitors to create their own colorful Slurpee remix via an interactive flavor selector, then share their mix with friends via social media. 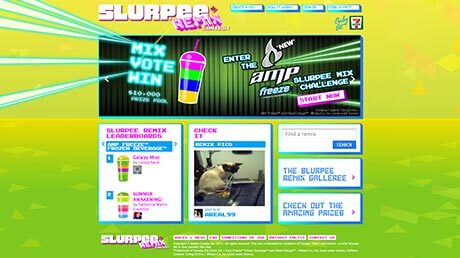 People were then able to vote on their favorite Slurpee remix and the highest ranking mixes won prizes. 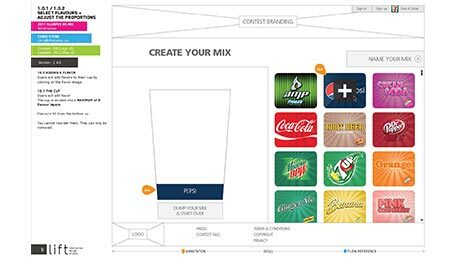 The application was integrated with two of the top social networking platforms (Twitter & Facebook) on many levels including user account creation, user authentication (OAUTH) and Twitter message postings. 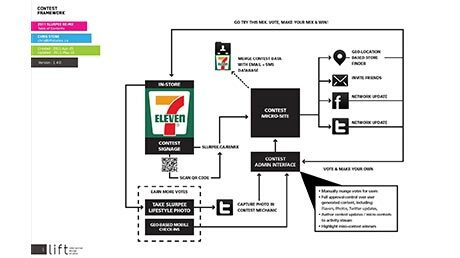 The application also filtered Twitter postings that contained a special hashtag (#slurpeeremix) and pulled photo postings from twitpic, Ow.ly, yfrog, Lockerz, and instagr.am into the contest application. 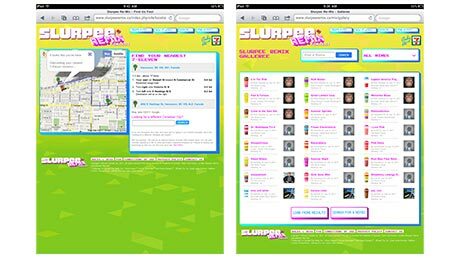 The store locator component was a particular challenge as we wanted to utilize location-aware features in modern browsers and devised, while still ensuring that it worked across older browsers that lack native location services. 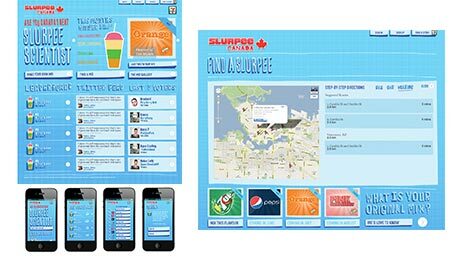 Because of the short timeframe for this project, we spent the first 48 hours whipping together app concepts & strategies which were then presented to 7-Eleven to help establish a realistic scope. 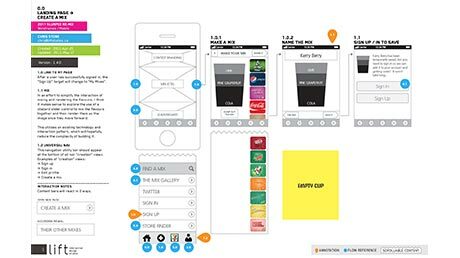 After the concept was settled on, our UX, design, and development teams worked in parallel to meet the accelerated timeline. 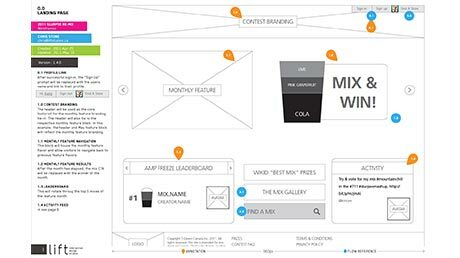 The UX team jumped straight into user flows & wireframes while the visual design team started putting moodboards together for the concept and the dev team (AutoBox) got to work on prototyping the interactive mixing mechanic and the geo-location component. 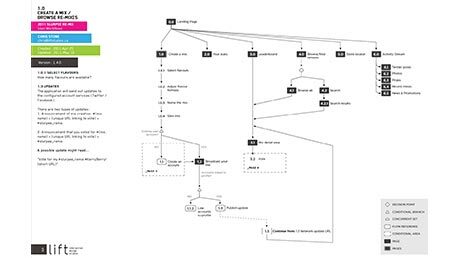 Due to the impacted timeline and scale of the project we contracted our friends at AutoBox Media to handle the development efforts ad work in conjunction with us as we navigated every other aspect of the project. 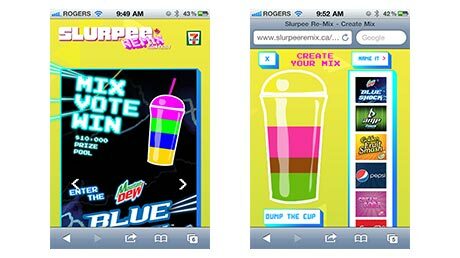 A total of three designs were created to find the happy balance of the audience’s needs and the feel of the 7-Eleven brand. 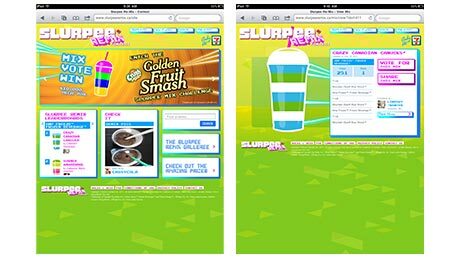 Slurpee Remix Contest is a Brand, Mobile, Web experience for Consumer Brands, Old-School Marketers which launched on July 11th, 2011.